In 1795 he joined the Navy and served as a ship's surgeon in the Caribbean for two years. Relying on the textbooks of the day, he dealt with large outbreaks of Yellow Fever and Typhus on board the ships. He had an attack of probable Typhus himself and had to prevail upon his assistants to treat him with purgatives and blood letting. He wrote about his experiences treating these diseases, which were incorporated into "Medicina Nautica" published in 1799. On Christmas Eve in 1799 he was on board the "Ethalion" when she ran aground and was wrecked off the Brittany coast; however all the crew were saved. He was appointed surgeon to the "Thisbe" in 1810 and to the "Adamant" the following year. This book consists of about 1500 rhyming couplets. He wrote it while convalescing from a severe illness, and he attempted to counter the prevailing allusions in prose to the "hardships and perils of the sailor". "The Naval Life is NOT a series of privations, distresses and affliction" he wrote in his introduction. Also included is a useful glossary of naval terms. He wrote his will in 1815. At that time he was a surgeon at the Mill Prison Hospital in Plymouth, built to receive American and then French prisoners of war. Thomas Downey died in London in 1816. "It may not, perhaps, be thought obtrusive, or altogether irrelevant, to say, that he was a man who feared God and honoured the King; a man, whom to know, was to love, to admire, to esteem, and to venerate. Nor were his talents inferior to his virtues. In the year 1813, he published a volume of Poems, comprising, 'Pleasures of the Naval Life," and 'The Battle of Trafalgar,' in the good old English heroic—the verse of Dryden and of Pope—which, unless the eye of friendship have overlooked their defects, and magnified their beauties, are superior, in their class, to any that have appeared since the days of Falconer. "Of warm and unimpeachable loyalty; of piety, pure, cheerful, and unaffected; of benevolence, the most active and disinterested; Mr. Downey closed a brief, but honourable and useful life, on the 5th of July, 1816." His accents firm, nor haply then expir'd." Of his seven children, one, Charles, became a doctor. Two other sons (John and William) followed him into the navy and both became lieutenants commanding the packets that did regular voyages to the colonies from Falmouth. 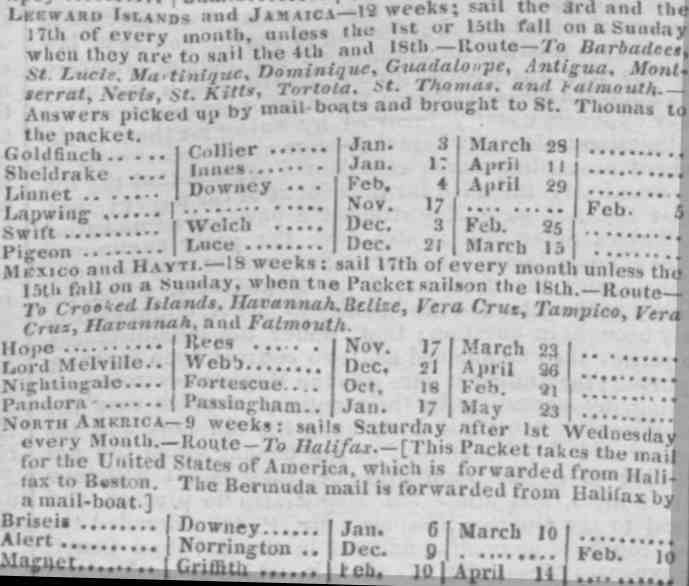 1838 Calendar of the packet ships' sailings from Falmouth showing the schedule for the Linnet and the Briseis commanded by the two Downey brothers. The voyage of the Briseis which left Falmouth on 6 January was its last. It never reached Halifax. Click on image for full schedule. Lieutenant John Downey died in 1838 when the "Briseis" packet sank en route to Halifax, Nova Scotia. (A year later Lieut Charles Webbe (who was married to John's sister-in-law) was also lost at sea when his ship the "Lord Melville" failed to return, again from Halifax.) Downey's widow went on to marry another packet commander, William Luce, whose name appears on the calendar as captain of "Pigeon". Memorial window to John Downey and William Luce in Mylor Church, Cornwall. His brother Lieutenant William Downey was commander of the "Linnet" and died in 1841 in Morchard Bishop whilst en route from Cornwall to London. Although Thomas's widow inherited the lease of his house in Covent Garden, she applied for assistance from the Charity for the Relief of Officers' Widows. She died aged 82 back in Crediton in 1851.